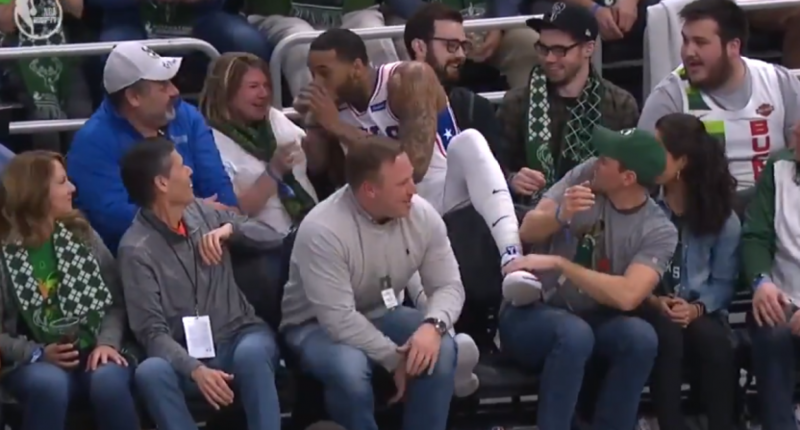 The Sixers are in Milwaukee today for a big Eastern Conference clash with the Bucks, but the highlight of the game so far may have been when Sixers forward Mike Scott took a tumble into the seats going after a loose ball. That’s not the fun part, of course; the fun part was when Scott saw what looked like an adult beverage in a fan’s hand, and decided to imbibe a bit before he headed back to the court. Who can blame him? Stadium cocktails are always expensive, so that sip was probably worth $3!